The Independence City School District Maintenance Department's goal is to have a safe environment for our students and staff as well as keeping the District's buildings and equipment in good condition.The maintenance department consists of our day and night custodians who maintain their individual schools, inside and outside. We also have a maintenance person who can assist a custodian if needed. Our custodians and maintenance person take pride in making sure that our facilities are clean and safe for our students, staff and visitors. Our district is embarking on a master facility plan. Please check back to this page for updates on not only the future plan for our buildings and facilities, but projects that are being done currently. If you have a question, please call Tom Dreiling, Assistant Superintendent at 216-642-5852. At the November 20, 2018 Independence Board of Education meeting, GPD Architects was hired to lead the district in developing a master plan of its facilities. They will engage the staff, community and key stakeholders in assessing current and future needs and consider options for future plans to best serve the students and citizens of the city of Independence. GPD Architects has extensive experience in designing educational facilities to meet the constantly evolving needs of teaching and learning in the 21st century. In the fall of 2017, the district took advantage of a Facility Needs Assessment program offered by the Ohio Facilities Construction Commission (OFCC). The OFCC provides a service to school districts, at no cost, that involves an architect firm and construction company coming on site to examine the current status of our facilities and create a building analysis report. The district received its OFCC building analysis report this summer. 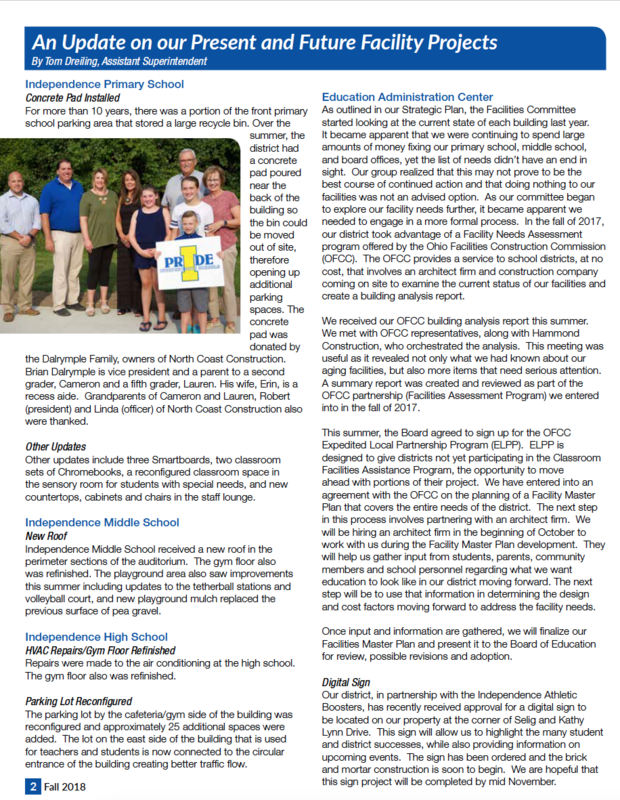 District administrators met with OFCC representatives, along with Hammond Construction, who orchestrated the analysis. “This meeting was useful as it revealed not only what we had known about our aging facilities, but also more items that need serious attention,” said Dreiling. A summary report was created and reviewed as part of the OFCC partnership (Facilities Assessment Program) the district entered into in the fall of 2017. This summer, the Board agreed to sign up for the OFCC Expedited Local Partnership Program (ELPP). ELPP is designed to give districts not yet participating in the Classroom Facilities Assistance Program, the opportunity to move ahead with portions of their project. The Board entered into an agreement with the OFCC on the planning of a Facility Master Plan that covers the entire needs of the district. GPD Architects will work with the district during the Facility Master Plan development. They will help the district gather input from students, parents, community members and school personnel regarding what we want education to look like in our district moving forward. The next step will be to use that information in determining the design and cost factors moving forward to address the facility needs. 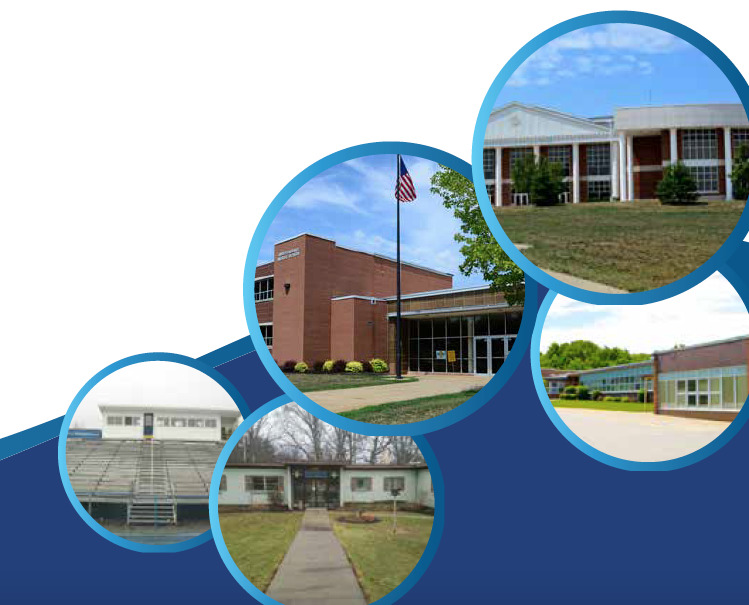 Once input and information are gathered, the district will finalize its Facilities Master Plan and present it to the Board of Education for review, possible revisions and adoption.